There was something special about WALL•E from the start. That now-famous teaser that came out a year ago only showed its titular hero for a few seconds, but it was more than enough to make almost everyone who saw it fall in love with him. He had the same effect on his creators. 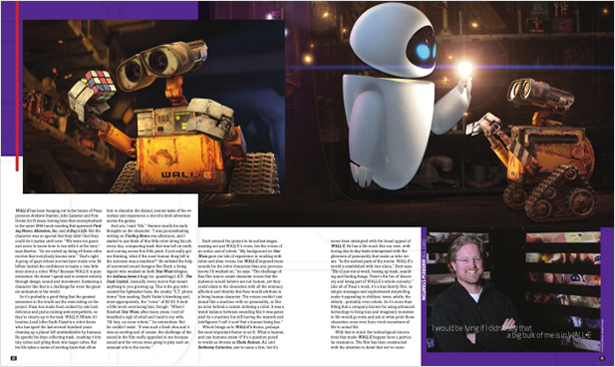 WALL•E has been hanging out in the brains of Pixar pioneers Andrew Stanton, John Lasseter and Pete Docter for 15 years, having been first conceptualized in the same 1994 lunch meeting that spawned Finding Nemo, Monsters, Inc. and A Bug’s Life. But the character was so special that they didn’t feel they could do it justice until now. “We were too green and naive to know how to run with it at the time,” says Stanton. “So we ended up doing all these other movies that everybody knows now.” That’s right: A group of guys whose movies have made over $4 billion lacked the confidence to make a cute little story about a robot. Why? 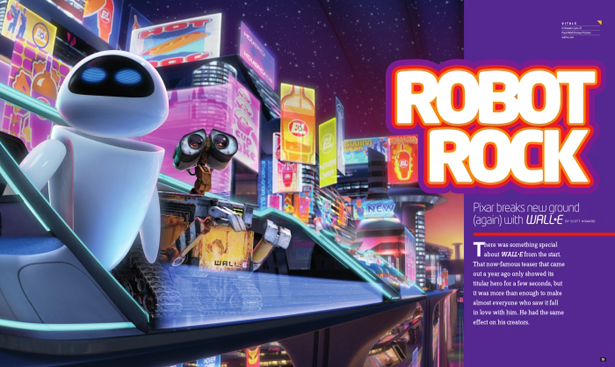 Because WALL•E is pure animation. He doesn’t speak dialogue and is created entirely through design, sound and movement. Sustaining a character like that is a challenge for even the greatest animators in the world. So it’s probably a good thing that the greatest animators in the world are the ones taking on the project. Pixar has made food cooked by rats look delicious and picnic-ruining ants sympathetic, so they’re clearly up to the task. WALL•E (Waste Allocation Load Lifter Earth-Class) is a robot drone who has spent the last several hundred years cleaning up a planet left uninhabitable by humans. He spends his days collecting trash, crushing it into tiny cubes and piling them into larger cubes. But his life takes a series of exciting turns that allow him to abandon the dismal, menial tasks of the everyday and experience a one-of-a-kind adventure across the galaxy. Which brings us to WALL•E’s theme, perhaps the most important theme in sci-fi: What is human, and can humans create it? It’s a question posed in works as diverse as Blade Runner, A.I. and Battlestar Galactica, just to name a few, but it’s never been attempted with the broad appeal of WALL•E. He has a life much like our own, with boring day-to-day tasks interspersed with the glimmers of personality that make us who we are. 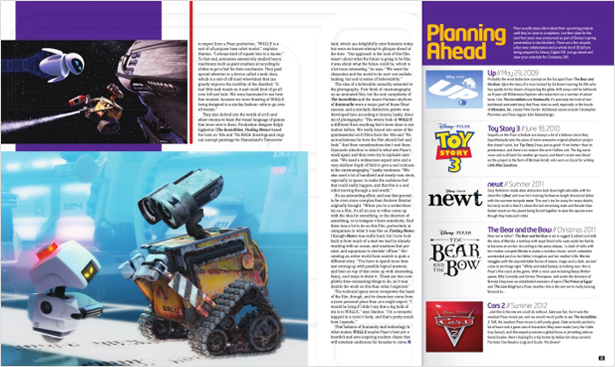 “In the earliest parts of the movie, WALL•E’s world is established with him alone,” Burtt says. “[He’s] just out at work, boxing up trash, searching and finding things. There’s the fun of discovery and being part of WALL•E’s whole curiosity.” Like all of Pixar’s work, it’s a true family film; its simple messages and sophisticated storytelling make it appealing to children, teens, adults, the elderly...probably even robots. So it’s more than fitting that a company known for using advanced technology to bring toys and imaginary monsters to life would go meta and ask at what point those characters cross from vivid recreations of life to actual life. But his efforts are far from in vain. Pixar sets the bar higher and higher with each and every outing, but WALL•E may be their best yet: a heartfelt and awe-inspiring modern classic that will entertain audiences for decades to come. Pixar usually stays silent about their upcoming projects until they’re close to completion, but their slate for the next four years was announced as part of Disney’s spring presentation to stockholders. There are a few sequels, a few new collaborators and a whole lot of 3D (all are being prepped for Disney Digital 3D). Just go ahead and clear your schedule for Christmas 2011. Probably the most distinctive concept on the list apart from The Bear and the Bow, Up is the story of a man (voiced by Ed Asner) nearing his 80s who has quietly let his dream of exploring the globe drift away until he befriends an 8-year-old Wilderness Explorer who takes him on a number of adventures. Like The Incredibles and Ratatouille, it’s precisely the kind of non-traditional animated story that Pixar does so well, especially in the hands of Monsters, Inc. creator Pete Docter. Additional voices include Christopher Plummer and Pixar regular John Ratzenberger. Sequels on the Pixar schedule are always a bit of a letdown since they hypothetically take the place of some awesome original phantom project that doesn’t exist, but Toy Story 2 was just as good—if not better—than its predecessor, and there’s no reason this won’t follow suit. The big name voice cast is all back for another go-round, and there’s some new blood on the project in the form of Michael Arndt, who won an Oscar for writing Little Miss Sunshine. Gary Rydstrom made alien abduction look downright adorable with his short film Lifted, and now he’s making his feature length directorial debut with the summer tentpole newt. This one’s too far away for many details, but early word is that it’s about the last remaining male and female blue-footed newts on the planet being forced together to save the species even though they hate each other. …and this is the one we could do without. Cars was fun, but it was the weakest Pixar movie yet, and we would much prefer to see The Incredibles 2. Still, the weakest Pixar movie is still pretty great. Cars certainly packed a lot of heart and a great cast of characters (they even made Larry the Cable Guy funny! ), and this sequel promises a global focus in jet-setting international locales. Here’s hoping for a trip home by Italian tire shop owners/Formula One fanatics Luigi and Guido. Per favore!